Our patients often mention that they would like fresh breath. The comfort that this brings in our everyday lives is something that Dentology Dental also strives to accomplish with all our patients. Even though you can’t see it, bad breath can be an embarrassing problem for sufferers. There’s a variety of causes behind the issue but, happily, just as many treatment options! Bad breath can be caused by several reasons, some of which are more obvious than most. For example, eating foods with strong flavours such as onions or garlic bread can lead to bad breath. Fortunately, those cases are generally easily fixed simply by brushing your teeth. Another cause is that you might just have a dry mouth, which is often the reason why many people wake up with bad breath after a night’s sleep. This is because saliva works to clean the mouth; when you’re dehydrated, it means that saliva can no longer wash away bacteria. In this case, a glass of water next to the bed is a simple way to quickly rehydrate and fix that ‘morning breath’. Other causes can be more serious. Smoking is a major issue for for your teeth, gums, oral hygiene and overall health. It often leads to bad breath, and since smoking can dull your sense of smell, it might be one that you won’t often notice yourself. Bad breath can even be a symptom of other problems, such as gum disease. In this case, bad breath that won’t go away even when you brush, or a persistently bad taste in your mouth, can be a sign of periodontal disease. This is caused by a build up of plaque, which can cause cavities. How can you fix bad breath? Many cases of bad breath can be treated by taking a look at your diet and tooth brushing routines to double check that you’re doing everything you can for your oral health. Note that quick fixes such as chewing gum or mints are only temporary solutions, and you may be better off employing a better brushing and flossing habit to fix the root cause. Naturally, bad breath caused by smoking can be addressed by giving up cigarettes. For dental problems (like gum disease) that cause bad breath, our team will advise you on a treatment plan depending on the severity of the issue. Most cases can be alleviated with good oral hygiene, while others may need a professional scale and clean. At Dentolgy Dental Care we will firstly aim on ruling out the above oral issues, bad breath can be a sign that something is wrong elsewhere. For example, it may be a symptom of a sinus infection or a medical problem such as liver disease. Our dental team might advise you to speak to a GP or specialist to rule out issues that may not be related to your dental health. If you have concerns about your breath and oral health, please contact our concierge team to book an oral health assessment. Experiencing issues with bad breath? Let us help. 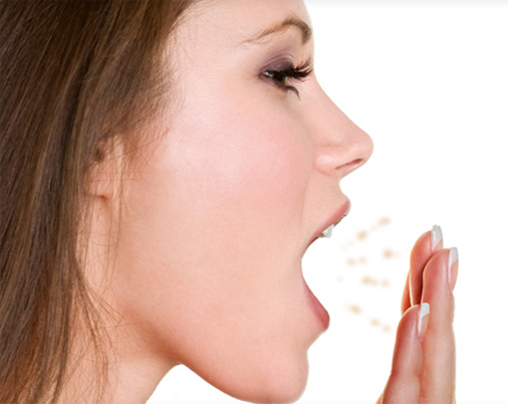 If you are experiencing bad breath, our appointments can help you feel the freedom that comes with a fresh breath. Get in touch with our concierge team today.